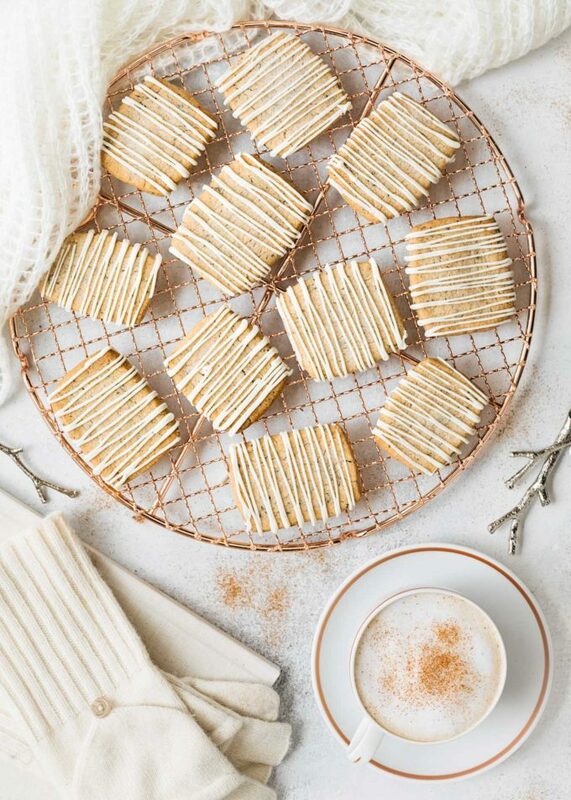 This recipe combines two of my favorite winter treats: crisp shortbread and Chai lattes. 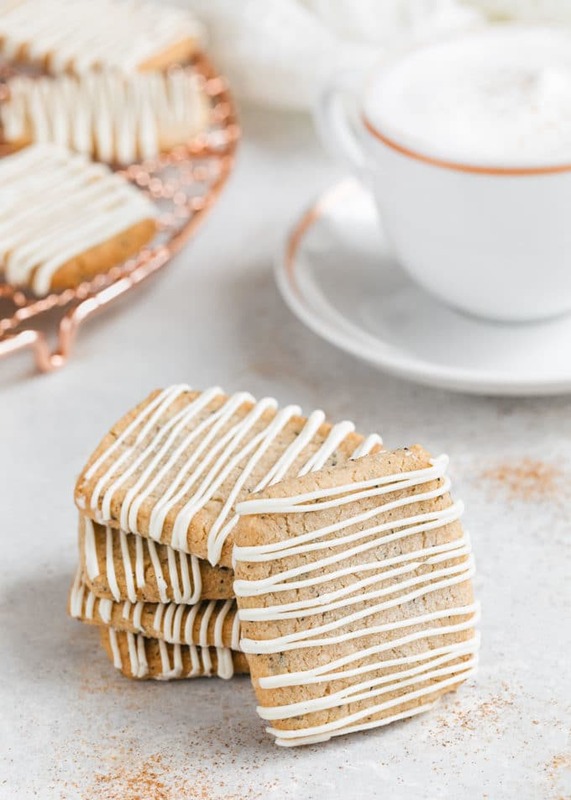 Speckled with black tea leaves and spices, and finished with a white chocolate drizzle, these Chai Shortbread Cookies are perfect for a cold day. When the snow starts to fall, three things are certain in my house: fuzzy socks, warm fires, and leisurely baking. There’s nothing cozier than watching the snowfall from behind the windowpanes while the aroma of buttery treats waft out of the kitchen. These crisp shortbread cookies, speckled with tea leaves and aromatic Chai spices, will instantly warm you, even on the coldest days. I like to finish them with a creamy white chocolate drizzle to offset the spices. Just like the foam on top of a Chai latte. I’ve been making this recipe during the Holiday Season for years (along with these Crescent Cookies and Chocolate Rugelach) and it’s always a favorite amongst my family and friends. In 2017, I was honored to share it with The Digest magazine to be featured in their holiday issue, to great feedback! Masala Chai is made with black tea, a combination of milk and water, and spices such as cardamom, cinnamon, and pepper. It’s typically sweetened with jaggery, an unrefined sugar. From this base, the popular coffeehouse Chai Latte was born, topping the sweetened, spiced tea with frothed milk. 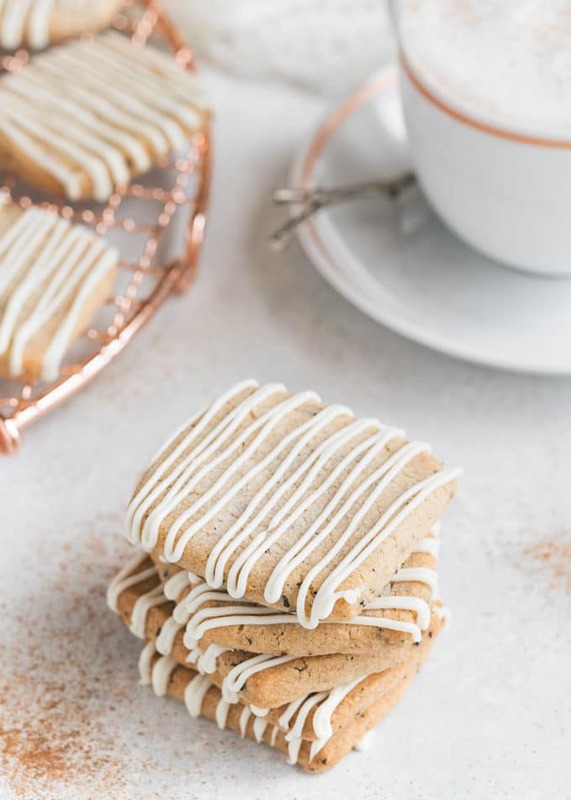 Both Masala Chai and Chai Lattes are two of my favorite cold weather drinks, and the flavors pair beautifully in buttery shortbread cookies. One of the great things about shortbread is that it’s easy to adapt to different flavor variations. Once you have the basic buttery dough, you can add just about any flavors you’d like. For Chai Shortbread Cookies, I started by adding finely ground black tea leaves to the dry ingredients. You can use any tea you like for this, whether it’s a loose tea or leaves from a tea bag. My favorite tea use is the Royal Tea Blend from Fortnum and Mason. When adding the tea leaves, you want to make sure that they’re very fine so that they speckle the dough without leaving large pieces of tea to chew. (Not the greatest feel on the palate.) Since it’s such a small amount, I like to use a mortar and pestle, but you can also give it a whir in an electric grinder. Can I customize the spices? Of course! 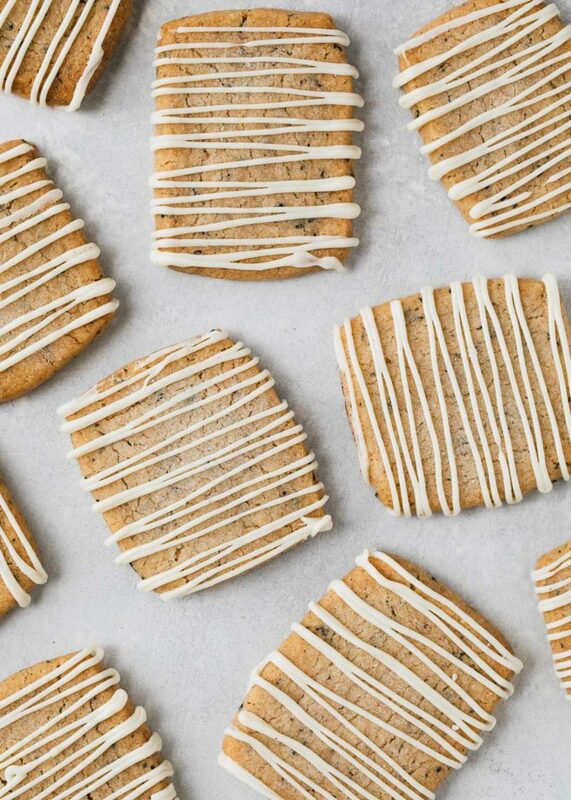 Along with the tea, I added a classic blend of ground spices to my Chai Shortbread Cookies: cardamom, cinnamon, ginger, peppercorns, cloves, and nutmeg. I find that a splash of vanilla extract rounds out the sweet and spicy flavors. These cookies are warmly spicy without being too assertive. If you like a very mild cookie, you can absolutely reduce the quantities of the spices to your personal preferences. Or, add other classic Chai spices that you love, such as crushed fennel seeds. I can never resist these cookies the day they’re baked, after they’re fully cooled and drizzled with white chocolate. (Hello, gorgeous!) That said, I love them even more on the second day, after the spices have a chance to really settle into the buttery cookie base and the flavors meld. I like to store Chai Shortbread Cookies for up to 5 days in an airtight container (an old butter cookie tin, actually), between layers of parchment or wax paper. Since they’re aromatic from the spices, I typically store them separately from other cookies, especially those with delicate flavors. Can I Ship These Cookies as a Gift? Absolutely! This shortbread ships beautifully. I’ve only had reports once or twice of a few stray broken cookie pieces. In general, they’re sturdy enough to ship with proper packing. To start, I typically box them up in a sturdy cookie tin or heavy cardboard treat box. I lay a piece of bubble wrap or crumpled parchment on the bottom of the container, and then wrap the cookies, sandwiched back to back in pairs, with plastic wrap. As I layer the wrapped cookies into the container, I place crumpled parchment, or sometimes even paper towels, between them. I finish packing with a second piece of bubble wrap to cushion the cookies on top. Always make sure that the sides of the container are cushioned as well. Be sure to tape the tin or box closed (even if you’re tying it with decorative string or ribbon) and place it in an outer shipping box with packing material for cushioning. Shipping cookies is a wonderful gift, with a personal touch. I’d love to receive a box of freshly-baked cookies at my doorstep this time of year, wouldn’t you? 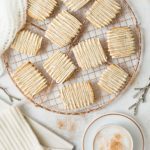 These easy to make, buttery shortbread cookies with classic chai spices are a great recipe for holiday cookie trays and gift giving. In a bowl, whisk together flour, tea, salt, and spices. Set aside. In the bowl of a stand mixer fitted with the paddle attachment, cream together butter and 1/2 cup sugar until light and fluffy. Mix in the vanilla. Add the flour mixture in 3 additions, mixing on medium-low speed until just combined. Scrape the bowl between additions. Turn dough out onto a lightly-floured surface and shape into a rectangle about 1-inch thick. Wrap in plastic wrap and refrigerate for 1 hour. Roll chilled dough between two pieces of waxed paper into a 9x10-inch rectangle (about 1/4-inch thick). Cut into 24 rectangular pieces. Transfer dough to baking sheet, spacing them about 1 inch apart. 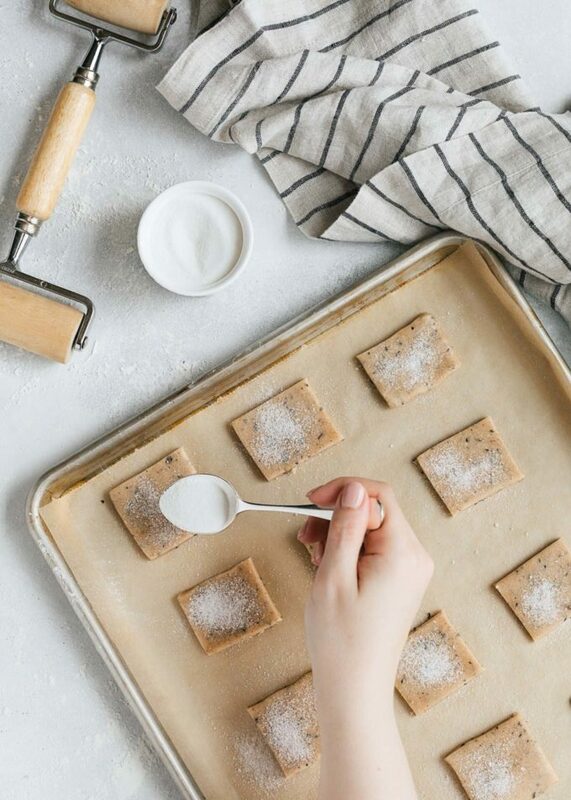 Sprinkle the top of each cookie with granulated sugar. Bake 15-20 minutes, until the edges of the cookies are light golden brown. Cool cookies completely on a wire rack. Place cooled cookies on a piece of parchment and drizzle the tops with melted white chocolate. Let the chocolate set at room temperature for about 10 minutes. Store cookies in an airtight container for up to 5 days. Yum! Made these yesterday. I may have left them in a bit long, since they’re a bit crunchy (though still pale), but regardless, yum! The spices are very warming. I left the white chocolate off half of them and was dunking them in tea, mmm. Hi Alyssa, you made them correctly. Like a classic shortbread cookie, they bake up crisp. Glad you enjoyed them! We loved these. I like making spiced cookies like pfeffernusse at Christmas and this one tastes just like Chai. I brought them to work and they were gone in an hour. These shortbread cookies are amazing! I love chai lattes so I jumped right on making these when you put them on IG. They’re crispy and buttery and the spices are right on the mark! Making them again today for my cookie swap tomorrow. Thanks for the recipe! I love chai spiced anything! And shortbread is such a classic. Love the combination of the two. Definitely adding this to the cookies to make this holiday season (and beyond)!